Welcome to Katfrog's Corner: "Jeremy Spoke In Class Today"
"Jeremy Spoke In Class Today"
My senior year of high school, a gifted student at another local high school brought a handgun to school and shot himself after English class because he wasn't making an "A". He died. As part of a gifted class, the teacher asked us if we understood what happened. She wanted to know why a bright young man would choose death over a failing grade, though to be clear here, I don't know if he was failing or simply getting a "C". And our answer to the teacher? At times, anything less than an "A" felt like failing since we were the "gifted" students, the brightest and (theoretically) the best; we had to get perfect grades. The pressure to perform perfectly infected every advanced or gifted class in every grade of high school. Simply passing was never good enough; even getting a "B" was shameful. In just over a week, both of my kids will be taking the Criterion-Referenced Competency Test (CRCT), a state-mandated test that supposedly measures their abilities in math, reading, language arts, social studies, and science. Georgia has used the CRCT since 2000, in response to No Child Left Behind. Personally, I despise the CRCT and its attendant hoopla. 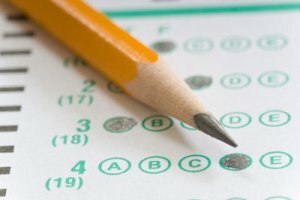 The school system makes taking the test and exceeding standards a big deal, starting in third grade. "If you don't pass, you cannot go to fourth" is a comment heard in elementary schools around Cobb County, and probably around Georgia every spring. And the third graders suffer from the pressure. The teachers also suffer from the pressure, with the threat of newspapers publishing the scores on a per teacher basis (e.g. Los Angeles), parents believing that their kids need to "exceed expectations" in every subject, and more than a week of teaching time lost during the testing period. Meanwhile, parents complain that the schools "teach to the test" and don't go beyond the curriculum enough. They want Little Johnny and Little Suzy to speak Spanish, learn how to type, and become a chemist during the school year. They also want the school day to either be longer (for the kids to learn more) or shorter (because the kids need more time at home to relax), more school days or less school days. In the end, the kids, teachers, and school systems spend an extraordinary amount of time and money on tests to prove that the kids have learned memorized a minimal amount of knowledge. And time that could have been used to help the kids develop their creativity, explore a special interest, or just play more. Because we don't need any more kids to think that grades and test scores are more important that life.